Quick! Your condo neighbour accidentally set the microwave timer for two hours instead of two minutes, and now those hot pockets he was warming up have caught fire and set the whole condo building ablaze! Where do you go? How do you evacuate? Who’s in charge of making sure everyone got out okay? And most importantly: does anyone have any extra hot pockets??? If you just read the above scenario and your only takeaway is that you kind of want some hot pockets now, we’re proud of you, because that must mean that you have an Emergency Response Plan (ERP) in place and know exactly what you’d do in the case of a fire, flood, or other building-wide emergency. If food is the least of your concerns after realizing your condo community might be just a tad under-prepared for handling a cataclysmic, hot-pocket-related fire, don’t worry: that’s precisely what we’re here to help you with today. First, a wee refresher: an ERP is a group of strategies and systems meant to safeguard people and property in the event of an emergency or accident, while also hopefully ending the crisis and avoiding further damage or injury. 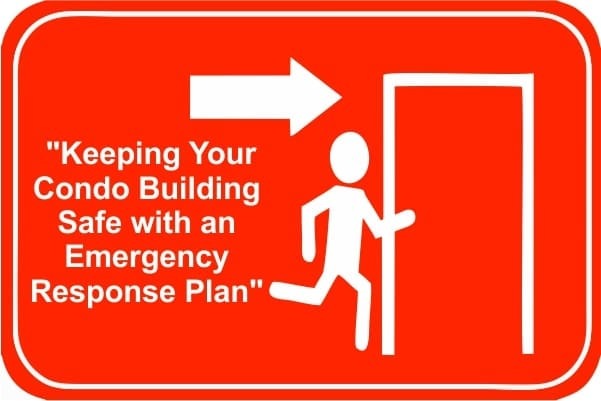 In the case of a condo building, an ERP should include evacuation routes, muster points, designated safety leadership roles, and possibly even provisions for first aid training for certain members of the condo community. ERPs have been proven to mitigate damage and loss, and we heartily encourage anyone living in a condo building to look at adopting one of these life-saving plans. In fact, we consider them so imperative that we don’t even bill extra when we help our clients develop them. It’s simply a prudent practice to have in place and, in all honesty, is just good business – especially when considering the alternative. Evacuation: During an evacuation, what’s the best route for each tenant to take? Where will everyone meet after they’ve escaped? Have these routes highlighted on each floor of your building. Accounting for everyone: Once you’re outside the building and have made your way to the muster point, it’s important to have a system in place to quickly and accurately determine if anyone is missing. This should also include the upkeep of an emergency contact system so that you can reach out to anyone who’s MIA, and are aware of residents who might be out of town or otherwise away from the property. Key building safety features: Your ERP should also identify key shut-off valves and safety features within each individual unit and throughout the building as a whole. Make the unit owners aware of this information, and you might even be able to head off a major disaster before it actually occurs. Follow these procedures and you’ll be able to rest easy knowing that in the event of a disaster, you and your building are as prepared as possible. Creating awareness around this sort of emergency response can also have the unintended bonus of identifying potential safety concerns before they cause any damage or injury, which is about the best scenario you can hope for when it comes to these sorts of situations! Do you have more questions about Emergency Response Plans? Need help developing your own condo’s ERP? Drop us a line at Catalyst Condo Management – we’ll be happy to chat with you about everything you need to know to keep your building safe and sound!